Michael McDonald was born on 12 February 1952, in St. Louis, Missouri USA, of Irish descent. Michael is a singer, songwriter, and record producer, probably best known for being a part of The Doobie Brothers band, but he’s also had a very successful solo career, as well as collaborating with various artists. All his efforts have helped put his net worth to where it is today. How rich is Michael McDonald? As of mid-2016, sources estimate a net worth that is at $40 million, mostly earned through a successful career in the music industry. He’s won five Grammy Awards and has also recorded music for film soundtracks. All of these have ensured the current position of his wealth. Michael attended McCluer High School, and during his time there, played for various local bands such as the Reebtoors, and the Majestics. In 1970, while playing for a group called Blue, his talents were discovered and it led him to move to Los Angeles, pursuing a career in music. One of his first major opportunities arose when he became part of the touring group of Steely Dan. He became a backup and lead vocalist – one of his most notable recordings was on the album entitled “Katy Lied”. He continued to be heard on albums such as “Aja” and “The Royal Scam”. Despite other commitments later in his career, he continued making music with Steely Dan until 1980. In 1975 Michael joined the rock band called The Doobie Brothers, initially as a replacement, but he soon became the permanent lead vocalist of the band, helping create songs such as “Minute by Minute”, “What a Fool Believes” and “Little Darling”. Many of their songs would become hits, and the song “What a Fool Believes” even won a Grammy for Song of the Year in 1980. During this time, McDonald collaborated with other artists as a songwriter, vocalist and keyboardist, such as Kenny Loggins and Toto. Eventually, The Doobie Brothers would go on their last tour and Michael would then embark on his solo career. He released his first solo album in 1982 entitled “If That’s What It Takes”, including songs such as “I Gotta Try” and “I Keep Forgettin’ (Every Time You’re Near)”. In the coming years he would continue to work with other artists, mostly as a songwriter or guest performer. Three years after his debut solo album, he released “No Lookin’ Back” which he co-produced; this also marked the first time that he had taken part in writing all the tracks. He had a few high charting songs including “On My Own” which featured Patti Labelle, and his career continued with collaborations in between album releases. He released “Take it to Heart” in 1990, with the title song becoming very popular. He then started to do songs for films including “South Park: Bigger, Longer & Uncut”, but also released a few more Grammy nominated albums during the 2000s, such as “Motown” and “Soul Speak”. Recently, Michael was seen as a part of “30 Rock”, and continues to make music around the country. He also reunited with The Doobie Brothers and Steely Dan for a few tours. 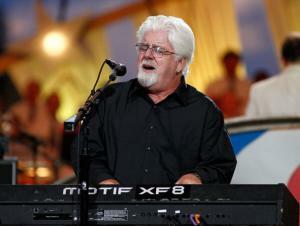 For his personal life, Michael McDonald is married to singer Amy Holland since 1983, and they have two children. They currently reside in Santa Barbara. 1 Ran, with Patrick Warburton, on the same high school cross country team (Servite HS, Anaheim). 2 He is the longest-running cast member of MADtv (1995). 4 Has a cameo in every Austin Powers movie. Body Waves 1992 writer: "Goo Boyz Rap", "Good Advice"
The Doobie Brothers lead singer Michael McDonald - Where is he now?